We were invited to a get together today (Not a SB party) and since the hostess has all the protein nibbles under control that gave me "permission" to do something I don't often do... pastry. Mini cream puffs to be exact. Here are some of the shells, fresh out of the oven. About the size of a golfball, 2 bites and it's gone. I got 38 at last count, but of course some were lost to check for doneness, then to make sure I was filling them 100%. Nothing I dislike more than a cream puff with little in it. This morning I injected them with pastry cream, so other than putting powdered sugar on them they are ready to travel. The sugar will be put on them when we arrive. 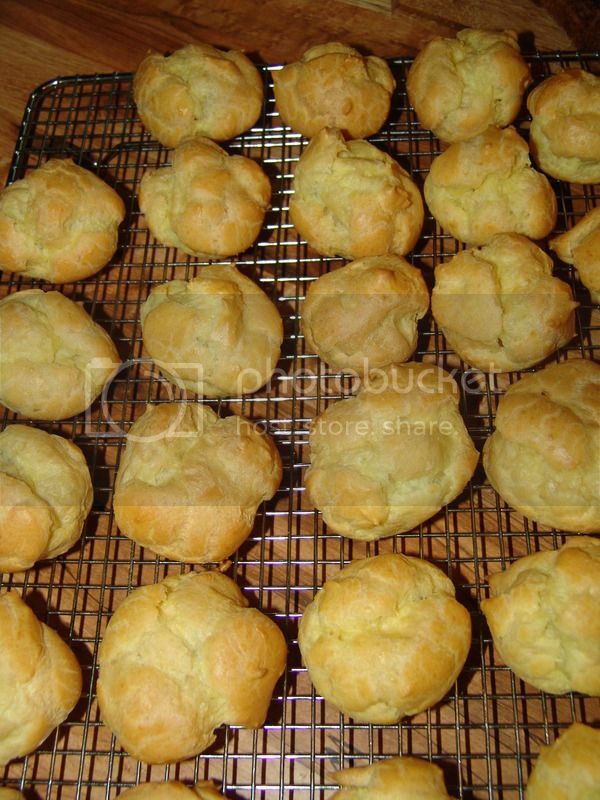 I was going to make mini-gougere which is an even smaller one bite cheesy puff, but I was going to inject those with a thick cheese "sauce" that solidifies and then see if anyone had a clue as to how I did it (or if they'd even notice). The trick is to not have the cheese break as it melts and then to inject it. But I didn't have the chance to do that this year; maybe next. Basically it's done the same way American cheese is made. BTW, it's soooo nice to have an oven that I'm not forced to fight! No knead crusty bread is on the schedule for this week; 4 loaves. 2 for baking immediately, one of those will be halved and frozen individually. The other 2 will be frozen in loaf pans and will be thawed and baked in future weeks for fresh bread as required.